here are some new pict of our 1945 typ 51. We just build the headlights with orginal drawings. The kdf nose and the tail lights are orginal. Yet another amazing car from you and your family! Nce headlights! I have seen those in old photos but never a modern photo of an actual part, the headlight units use leftover Kubel headlight assemblys and fit into the Beetle fenders because I assume in 1945 the Bosch and Hella units were unavailable due to their factorys being in ruins, good job with the replicas! Wasn't there a discussion about these taillights a few years ago? Hopefully it may be ready for bad camberg so we can see it in person. Great looking car! Keep up the good werk! So what's the verdict? Not Barndoor but early Type 1? Would the 45 or 46 beetle have the VW logo stamped into the bezel, or would it have the cog logo? And, would they have had the chrome or polished bezel in '45 or'46? 1951 catalogs list those taillights as barndoor, but they may have also been used on the '45/'46 beetles. 1952 catalogs list those taillights as barndoor, but they may have also been used on the '45/'46 beetles. Maybe not....but here is a 1949 catalog that shows the "older" light and the "newer" lights. And the second pic is a 1951 catalog showing those taillights as barndoor. the spring on the bottom of the lense. This is typical for the pre 49-taillights. Chrsitian and his father also owns a 1950 Kombi (FIN 2469) which still has its original taillights. So they know the difference. You are true, the look a little bit simular, but if you compare them, they looks completely different. these headlight are tripp'in me out , very nice job . Are you missing any catalogs from your collection? These Pre-49's are actually more correctly 46-49's and very similar to the Euro-spec 1957 splitty bus taillights. The pre-46's are different. 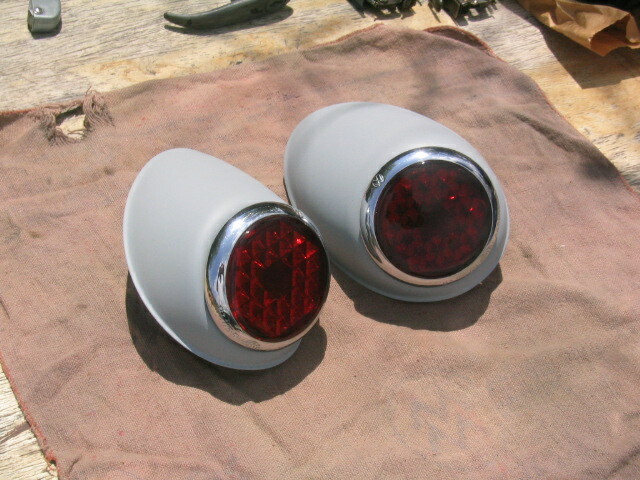 And here is mine that I made the housing for and used Euro-57 splitty taillights. The split lense is fastened with the spring but the splittybus with two screws..
Yeah, a 1945 catalog....but I am always on the look out for more.